In 1899, the Texas Legislature authorized the formation of the Southwest Texas State Normal School, which opened in San Marcos four years later. At the time, the school’s mission was to prepare Texas public school teachers, but over the years, it has undergone several expansions and name changes to reflect its evolution into the major multi-purpose university Texas State has become. From its humble beginnings located in a single building, Texas State’s original San Marcos campus has grown to cover a 485-acre campus that is home to 267 buildings, as well as an additional 5,038 acres of recreational, instructional, farm and ranch land. The university added a second campus in Round Rock, which has grown from 15 temporary buildings to a 101-acre campus with state-of-the-art facilities. Texas State’s student population has kept pace with its physical expansion, growing from 303 in 1903 to more than 35,546 in 2013 – marking the 16th consecutive year of enrollment growth for the university. Anticipating physical and population growth to continue into the future, Texas reviewed its policies and determined the necessity of implementing electronic key control systems in sensitive areas. Based on its size, the understanding was that as many as 85 of these systems could potentially be needed as part of this initiative. Texas State was faced with a particularly challenging growthrelated issue in September 2013, as its freshman enrollment surged to more than 5,000. Like many universities, Texas State requires its freshmen to live on campus, which it sees as a tool for retention. That policy seems to be working, with approximately 80 percent of freshmen living on campus technically returning for the following semester. To accommodate the growing ranks of on-campus residents, the university has pursued an aggressive construction campaign, building a new residence hall complex every two years to house approximately 600 additional students with plans to break ground this fall on a third new housing complex. In all, Texas State spent more than $190 million on new or renovated buildings, with more construction planned into the foreseeable future. With a large number of individuals requiring access to so many facilities, the university recognized that key management had the potential to become a high-risk issue and determined to become proactive in reducing that risk. Maintenance staff members would often reach for the key to a particular building they needed to access, only to find it was already checked out. They would then be forced to go through the time-consuming – and frustrating – process of determining who had the key last and tracking that person down to retrieve it. 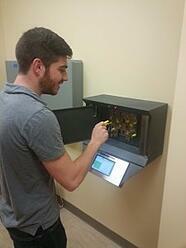 The decision was made to update key management policies and practices to make them more efficient and effective. To combat these problems and increase the security and effectiveness of its key management, Texas State charged its University Police Department and other stakeholders with undertaking an extensive review of the available options for key management systems on the market. This exhaustive process involved gathering research from printed materials and online research, having discussions with current customers of the various vendors, and listening to on-site presentations from the companies under consideration. 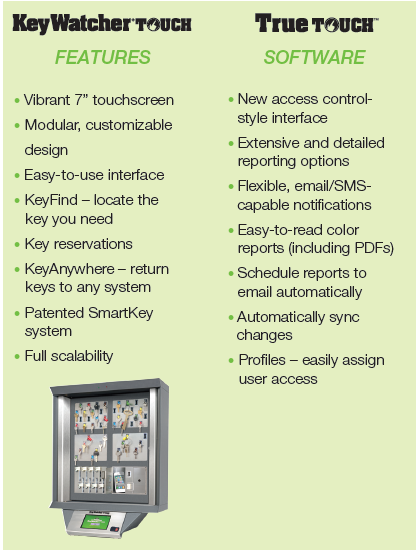 At the conclusion of its review of key control cabinets and systems, Texas State chose KeyWatcher Touch from Morse Watchmans. 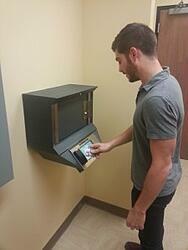 The main factors that led Texas State to choose KeyWatcher Touch systems were its robust feature set and competitive pricing. The school was also impressed by Morse Watchmans’ receptiveness to its specific needs – a six-digit user ID, for example – and ability to implement changes quickly. Access to support was also a main consideration, so Texas State appreciated that the system was produced domestically by a company with a 130-year history. 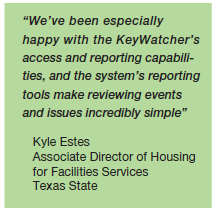 Of the KeyWatcher systems to be implemented, the largest number were to be deployed for Texas State’s Department of Housing and Residential Life, which provides housing and services to approximately 7,000 residents in 25 facilities. The department also operates a facilities service group consisting of 110 full-time employees and a staff of 170 building paraprofessionals. Because of the personnel changes the department experiences on an annual basis, the system’s enterprise management capability has been a valuable feature, as have its robust reporting capabilities, says Kyle Estes, Texas State’s Associate Director of Housing Facilities Services. Having keys available in each residence hall for use by maintenance staff has made the department more efficient and reduced their liability; staff no longer need to carry multiple master keys across campus for different buildings. 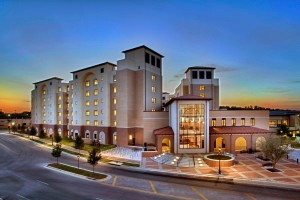 All KeyWatcher Touch systems deployed at Texas State are connected to the university’s network and interface with its card access and email systems. The ease of use and centralized management features provided by the system’s network capabilities have streamlined the once cumbersome process of generating reports and reviewing incidents. One particular feature, the ability to access the system from anywhere, has made the system even more effective, Estes says. As one of the earliest adopters of KeyWatcher Touch, the Housing and Facilities Department served as a test case of sorts for the system. Based on the success the department has had, combined with its continued rapid growth and expansion, Texas State University’s 85-system implementation is ongoing. As more systems are added, expansion will be a consideration moving forward, but Estes doesn’t anticipate that being a problem.